My professor was new to our school and the United States, having only recently left China. I had the privilege of observing this brilliant acupuncturist as he assessed patients’ concerns and composed treatments. In Traditional Chinese Medicine (TCM), the word “pattern” is used instead of “diagnosis.” Where conventional Western medicine works to whittle an illness down to a single cause, TCM instead looks at the whole body-mind ecosystem and attempts to find a pattern to what is happening. A treatment plan is created to restore balance and health. My professor had noticed that Americans appeared in our clinic with one predominant pattern―Liver-Spleen disharmony. This doesn’t (necessarily) mean there is anything structurally wrong with a patient’s liver and spleen. The issue lies in the functions that the Chinese medical system attributes to those organs. Patients with Liver-Spleen disharmony might express concerns such as headaches, high stress, digestive difficulties, menstrual pain, irritability, fibromyalgia, or a host of other symptoms. Stress: According to TCM, the liver is in charge of the free flow of Qi. Qi is energy that moves through your body along channels. When you are healthy, the Qi moves freely. When you are in pain, sick or emotionally upset, the Qi can become stuck. When you are in a state of stress, the qi often stagnates (which you might express by clenching your jaw, stopping breathing or tensing your shoulders). Emotions: In TCM, we believe that emotions come and go like water in a stream. If we let them come and express them, everything should be fine. However, sometimes we deny or “stuff” emotions, such as anger, sadness, grief or jealousy. I often speak to people who have semi-successfully hid from emotions for months or years with unintended physical results. Exercise: If we aren’t physically moving, Qi is less likely to move. Food: In TCM, the spleen is largely attributed with the transformation of food into energy. Some foods, such as soup and lightly cooked vegetables, are easy to transform. Other foods, such as dairy, sugars, and fried foods, are difficult to transform. Eating too much of the latter can bog down the digestive system. 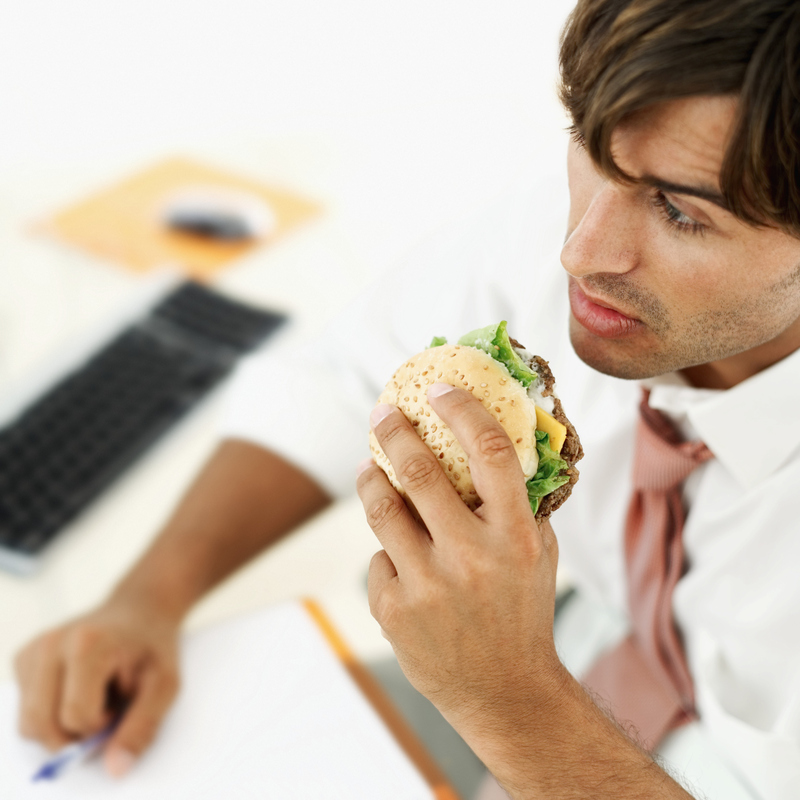 And if we do other things while eating (working, reading, driving), the body’s ability to focus energy on digestion is hindered. Does any of that look familiar? Do you see it in your life or our culture? I would offer that the “American way” often encourages stress, overworking, emotion-stuffing, screen-watching, and food-as-stomach-filler. Even when we try to avoid these things, it is easy to feel pulled in a number of directions in our daily lives. And usually our self-care is the first to go. So what do we do? TCM offers solutions like acupuncture and Chinese herbs that can help. But improvements from those therapies will only be sustained if lifestyle changes are made, too. Meditate or find another way to manage your stress. Biofeedback and Mindfulness Training are available at the Penny George Institute and offer excellent approaches to handling stress. Feel. Know that your feelings are right, and they are temporary. If you feel you need help processing your emotions, please consider seeing a therapist to help you. Move. It doesn’t have to be high-intensity interval training. Any time you move your body in a way that you enjoy, that is good. Savor. Experience and enjoy your food. Experiment. Slow down. Smell it. Taste it. Eat only enough to feel 70 percent full. Good luck – together we can work to change the American pattern to one of balance and harmony. Megan Odell, LAc, MS, is a licensed acupuncturist and offers services at the Penny George Institute for Health and Healing – Abbott Northwestern. Categories: Acupuncture, Happiness, Mind body connection, Nutrition, Stress Management, Traditional Chinese Medicine, Uncategorized, well-being | Tags: acupuncture, destress, digestive difficulties, digestive system, exercise, fibromyalgia, headaches, integrative health, integrative medicine, irritability, Liver-Spleen disharmony, meditation, menstural pain, mindfulness, Minneapolis, Penny George Institute, physical activity, restoring balance, stress, Traditional Chinese Medicine, Twin Cities, unhealthy American habits, well-being, wellbeing, wellness | Permalink.